This section of the Roaring Plains Trail at the Roaring Plains Wilderness in Randolph County, West Virginia is a moderate 4.7-mile out-and-back hike to the Flatrock Plateau, a campsite with a lookout point, and amazing views of West Virginia's mountains from the Allegheny Front. This portion of the Roaring Plains Trail ends at the campsite and lookout point 2.35-miles in from the eastern trailhead. The hike includes a great lookout point at the end and plenty of blueberries to eat along the way during June and July. The eastern trailhead can be found along the pipeline at the end of the Roaring Plains FR-70 Trail as this is where we started our hike; however, there's a trailhead along the Flatrock Run Trail to the west as well. To reach the eastern trailhead, you first need to hike in 3.4-miles one-way along the Roaring Plains FR-70 Trail. The woods in the beginning of the trail feel more like a jungle during the Summer, with massive ferns to the side of the trail and moss-covered everything. Shortly after, you'll start gaining elevation and you'll leave the forest behind as you start to climb up to the Flatrock Plateau. Eventually the trail evens out and you'll be gradually hiking uphill towards the lookout points to the west. Once on the plateau, and in spots before it, you'll find plenty of blueberry bushes to snack on. There's also an amazing view of the plateau if you keep an eye out for it - stop every now and then to check your surroundings as the rocky terrain causes you to pay attention to the ground more than the scenery. Note: The trail itself can be annoying for a couple of reasons. First, the terrain is very rocky, which slows you down. Second, if it recently rained, you'll find sections where you have to hop from rock to rock. Plan on hiking slower on this trail because of the rocks. Lookout Point: Around mile 2.1 you'll notice the rocks go away and you're hiking in the woods again. At mile 2.3 or 2.4, as the trail starts to curve to the right-hand side again, you'll notice a large clearing where you'll find 2 campsites. Just behind the campsites is a lookout point. There are likely more lookout points than this one, but we did not explore the trail any further. Campsites: There's at least one small campsite around mile 1.5 and another close by, but there's only room for about 1 tent - or maybe a couple of hammocks. 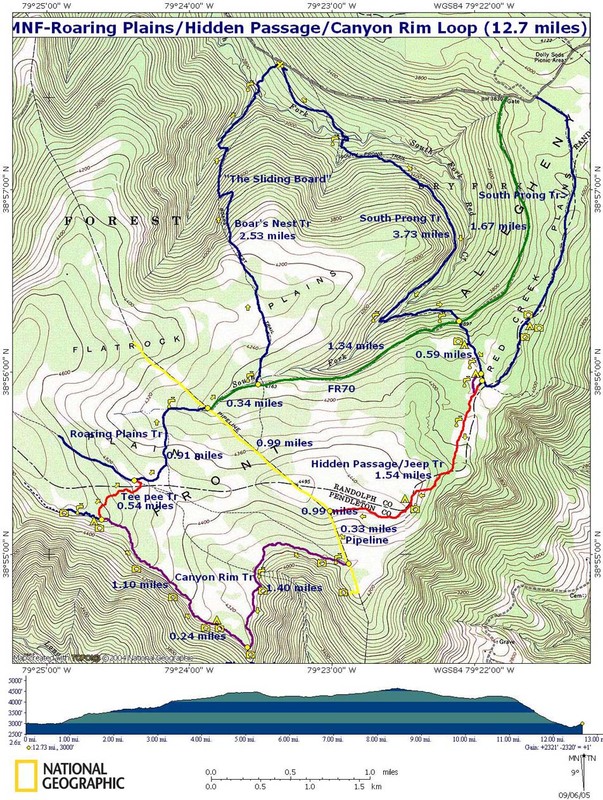 Mileage: Please note that if you plan to reach the lookout point at mile 2.4, this will be a grand total of a 12 mile day hike as you need to hike out and you need to hike out-and-back on the Roaring Plains FR-70 Trail.